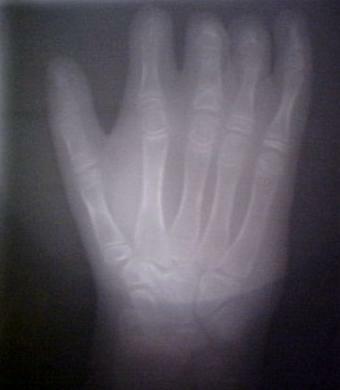 A x-ray of my right hand taken around 2003. I have a disability called Poland Syndrome. Poland Syndrome is a birth-defect characterized by the absence of the pectoral (chest) muscle on one side of the body. In my particular case, I am missing my right pectoral muscle and one of the side-effects is that I have a smaller right hand with shortened fingers that are not really capable of bending. In the fifth chapter of Mika LaVaque-Manty’s the Playing Fields of Eton that is called “Being a Woman and Other Disabilities,” LaVaque-Manty claims that, “In disability sport, the idea of open competition is that anyone who can compete can join in. It is not only true in disability sport,” (LaVaque-Manty 147). As a person with my own disability and drawing from my own experiences and thoughts, I believe if a disabled person can participate in a sport, disability or able-bodied, he or she should have a right to compete with or without the help of an aid. From my own experiences with sports, such as baseball, if a disabled person is able to compete, they should have a right to do so. I used to play on a baseball team when I was younger. In order to play, I would have to wear my baseball glove on my left hand to catch the ball, and as soon as I caught the ball, I would immediately rip off my glove and throw the ball with my left hand. In order to play well, I had to do this quickly. I did not need any aids in order to play; therefore, if I could do well enough to compete, then I should have a right to play just as the fully able-body athlete does. The only roadblocks I could have faced or any other disabled person to keep from contending would be overcoming value barriers such as a team not wanting an athlete with a small hand on the team. Fortunately, I never had to experience such barriers. When it comes to disabled people competing in sports with the help an aid of some sort such as a prosthetic limb, if that disabled person can participate in competition, then they should have a right to compete. In one case, South African sprinter Oscar Pistorius was born without fibulae in his lower legs and uses prosthetic legs known as the Cheetahs in order to make himself participate in running (LaVaque-Manty 147). If the Cheetahs enable Pistorius to compete on the same scale of able-bodied sprinters, then he should be allowed to compete. There was some debate about Pistorius’ use of his aids, “Pistorius’s case required complicated adjudication on whether he had an obvious advantage or simply lots of talent or hard work,” (LaVaque-Manty 148). The use of an aid can bring questions on whether disabled athletes have advantages over able-bodied athletes. I personally believe that if an aid is there just to simply fulfill a function that a disabled person does not have, then by all means, let disabled athletes with aids compete on the same level as able-bodied athletes. In addition, let’s say I wanted to take up the sport of boxing. Boxing is a sport that I really should not participate in because it would be very dangerous for me to participate in (not because it’s dangerous already). Since I am missing my right pectoral muscle, the entire right side of my rib cage would be exposed. However, if there was some way to create a special pad that could cover my chest that would be of the same shape and consistency of a pectoral muscle, then I could be possible for me to participate in boxing. Yet, it could be brought up that it would be unfair for me to box because I have a pad over my chest that could put me at an unfair advantage to other boxers who do not need a pad over their chests. There would have to be some sort of institutional reform to determine if my participation would be equal and meaningful just as Pistorius had to undergo a case with the International Amateur Athletics Federation (LaVaque-Manty 147). However, from my view as a person with a disability, if there is an aid that can cancel out a disability to make a person equal, then they should be all means have a right to compete. As a person with Poland Syndrome, I know what it is like to play in sports where you have to work harder than everyone else. Disabled people are placed at a disadvantage in life, and if they are able to overcome their disabilities to participate in sports, then there should be no restrictions to keep them from doing so. LaVaque-Manty, Mika. The Playing Fields of Eton. University of Michigan, 2009. 131-152.